What joy this title brings to all our hearts! It is a wonderful program that Father Chad Partain is championing throughout the world for our Youth! Through Him, Our Blessed Mother is calling Her children to a greater love and participation in the Holy Eucharist. 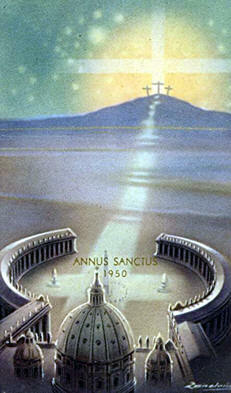 Jesus Christ founded His Church to teach the truth and to sanctify the world. It continues Christ’s work to make disciples of all Nations, baptizing them in the name of the Father, and of the Son and of the Holy Ghost, teaching them to observe all that Christ has commanded, even unto the consummation of the world. Christ founded that Church and placed Peter as Its head, to whom He gave the promise of unshakable Faith. The Church would be built solidly upon Peter as upon a rock; no storms would ever tear it down. It was to teach all men, and Christ Himself would be with It, always, so that It could make no error in teaching His Divine Truth. It had the power to rule. It was a Kingdom; It had a head, Peter, and various classes of Apostles and disciples, bearers of the Word, all under Peter, all subject to his authority. Christ founded that Church as an infallible teaching authority. Salvation comes from Christ through His Church! The Church is the Mystical Body of Christ. In this great Body of Christ, there is a constant and mutual sharing of help among all the members. If one member suffers anything, all the members suffer with It or, if one member glories, all the members rejoice with It. The Church is the Mystical Body of Christ; Its Head is Christ Himself Who gives life and direction to all Its members. The members are all united to the Head and to one another. Eye has not seen, nor ear heard, nor has it entered into the heart of man, What things God has prepared for those who love Him! In Heaven, we shall see God, face to face. 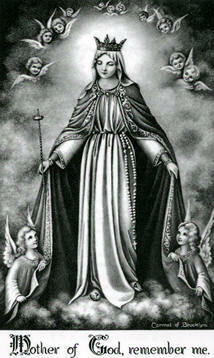 Let us ask the Queen of Heaven to grant us every grace necessary to obtain our final perseverance and a holy death! Dear members, we place your daily needs, spiritual, physical and material, before the Altar of God. In doing this, may our mission in the bosom of Holy Mother the Church be strengthened and completed. We have received your generous gift which is truly a great help for our work of reaching all souls with devotion to the Immaculate Heart of Mary and uniting them through the Holy Rosary. We realize that each one of you carry heavy crosses and struggle each day to do God’s Holy Will at home, at work and in your community. It would be very easy to get discouraged but, with great vigor, drive that thought out! Keep your eyes on your eternal goal, Heaven! Rest assured of our prayers for you each and every day. Man is the most perfect, the most capable and the most beautiful of all God’s visible creatures. He is formed of matter and spirit, body and soul. Man stands upright and proclaims dominion over all other creatures. The spirit of man, his soul, has powers that do not belong to matter. The soul is immortal, intelligent and master of itself. Adam and Eve were partakers of the divine nature and adopted sons of God. Their souls were alive with Sanctifying Grace, a supernatural gift infused in the soul, which makes it pleasing to God. No one can merit grace; it is a supernatural gift from God. Grace is a real physical-spiritual thing which exists in the soul. There is a difference between the way we love and the way God loves. We love someone because we see and appreciate something good in that person. God cannot love in this way because it would imply that something distinct from Himself motivates His Love. No! God loves in a totally different way. He places in our souls the supernatural Gift of Sanctifying Grace, which makes us worthy of His Love and Eternal Life. Grace is not God Himself, but it is a gift which implies the presence of the Giver. Grace makes us holy, it deifies and sanctifies us. There are two factors at work in the operation of Grace: God’s action and man’s action. Unlike other graces, Sanctifying Grace is conferred on us for the benefit of others. Grace is multiplied as man uses it. When works increase, so does Grace. Generally, there are two principal ways to obtain grace: through the Sacraments and through prayer. The one thing that impedes Grace is SIN. The source of all supernatural energy is God, but the flow of that energy to us awaits the action of prayer. Prayer is the key that unlocks the treasures of our all-benevolent God! Be faithful to your Daily Decade, and the flood-gates of Grace will be opened to you! Sin nailed Him to It! This entry was posted on Friday, March 22nd, 2013 at 9:37 pm and is filed under NewsFlash, Saint Philomena. You can follow any responses to this entry through the RSS 2.0 feed. Both comments and pings are currently closed.